Europeans do coffee very badly or very well. This morning’s coffee is awful. Draining my cup bit-by-bit reveals a film of the powder used to flavor the heated water. Techno is the bar’s music-of-choice, even during breakfast hours. Ugh. At 5.50€ and consisting of cold cuts, rolls, jam and Nutella, the price of the breakfast could be better and it could be worse, but it’s definitely an improvement over the coffee. My roommate said “bye-bye” with an Eastern European accent, but I couldn’t identify what it was, exactly, and we exchanged no words other than our greeting and exit salutations. Usually I can pick out accents and languages from the major European countries, but the further east we go, the less apt I am at distinguishing modes of speech. People here smile a lot more than they do back home. I think it may be because we realize that we don’t speak the same language, and we want to communicate friendliness. I make a conscious effort to smile as often as I think of it, because people tend to give back whatever I throw at them. I move my life to my new apartment – it’s only five blocks west and it’s my home for the next week. I walk past it on the first go because I’m too tuned into looking for address numbers (that are difficult to find) to see much of anything that isn’t exactly the sign for which I’m looking. 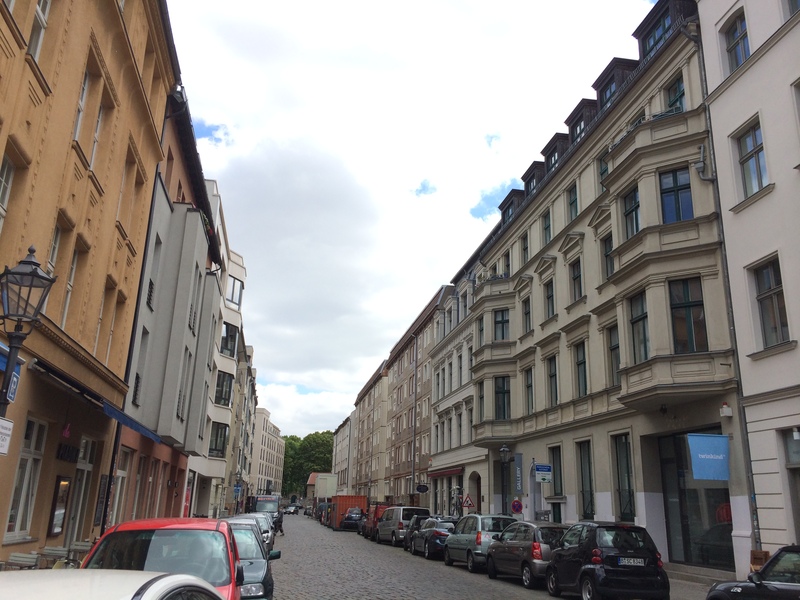 The place is in north Mitte – just south of Torstrasse and near Rosenthaler Platz. My host catches me, calling to me in English, before I wander off in worried confusion. He greets me warmly but in a slightly stifled manner, and expresses genuine surprise that I really like Germany and that I am trying to learn its language and culture. He’s looking for an explanation that is satisfactory on some level I’m not able to muster. He posits that Germans, while not exactly rude, are not particularly friendly; his own behavior is a good example of this approach. These are my kind of people, for the most part. Too much friendliness seems associated with a kind of loose moral character. I’m looking at you, Italianos (tongue-in-cheek, of course). This entry was posted in Travelogue and tagged Berlin, books, bookshops, bookstores, Culture, mitte, reading, relaxation, Slow Travel, Walking. Bookmark the permalink. A great read & love the photos. Thank you for reading and commenting. Very glad to hear that you like it.